The necessity for transportation and logistics not only for the different countries but in the entire European continent is increasing. Large and small producers and traders rely on logistics of raw materials, materials and most of all of the ready products to reach various European countries. 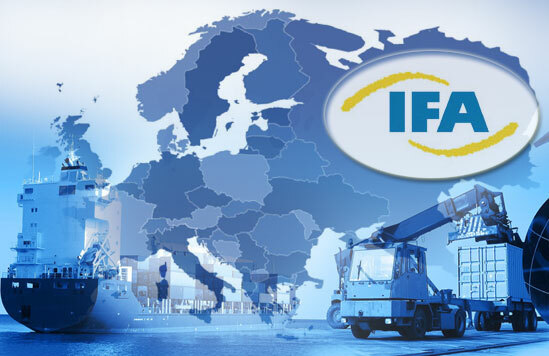 IFA’s mission is to make freight forwarding of goods and cargo easier through the European network for logistics. Small and medium independent forwarders throughout Europe are members of our network. Today they are more than 50 of them. Our goal is to have at least one member in each European country in the near future. Combined shipments through the distribution of sectors of the route, in order to achieve optimal prices and delivery times. We offer groupage transport service to destinations throughout Europe, so that the small shipments can be transported regularly, at lower prices and to be delivered in time, without delays. We offer you forwarding of complete loads, with transportation especially delegated to transport your cargo, whenever you need it. Through are international freight services you are able to take advantage of our green freight forwarding services – we take special care for maximum preservation of the environment. Our international freight forwarders are located in the main, central European countries, on the freight forwarding and trade crossroad, such as Germany, Italy, Netherlands, Switzerland and the Czech Republic. Our international freight services to Great Britain and Ireland, two especially important destinations for international commerce and international freight forwarding, are implemented in cooperation with our partners in these two countries. We have partners in Eastern Europe, in countries like: Poland, Ukraine, Bulgaria, Greece, Turkey and Romania. You can count on our services with our partners from the Scandinavian countries, such as Norway, Denmark and Sweden. We offer shipments with the help of the branches of the European network for logistics in the Baltic countries Estonia and Finland for now, with a prospects for expanding the freight forwarders network in this region. Our network of freight forwarders covers countries in the Mediterranean region including: Malta, Slovenia, Spain and Portugal.